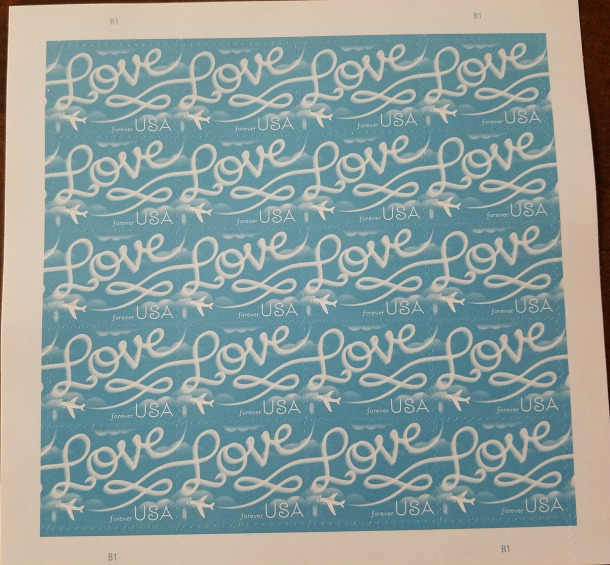 This is a pane of 20 self adhesive FOREVER stamps featuring Love Skywriting. Designed by Louise Fili from New York City, illustrated by Jessica Hische of San Francisco with Derry Noyes of Washington, DC as the art director, the Love Skywriting stamp is a cheerful and romantic continuation of the U.S. Postal Service's Love stamp series. Back of sheet is blank. Sheet measures 5-1/2" x 5-1/2". Mint condition. Shipping is 4.95 within the USA. International shipping rates apply. Shipping always combined on multiple purchases. Please enjoy browsing this store for lots more collectibles often. Thanks for stopping by!